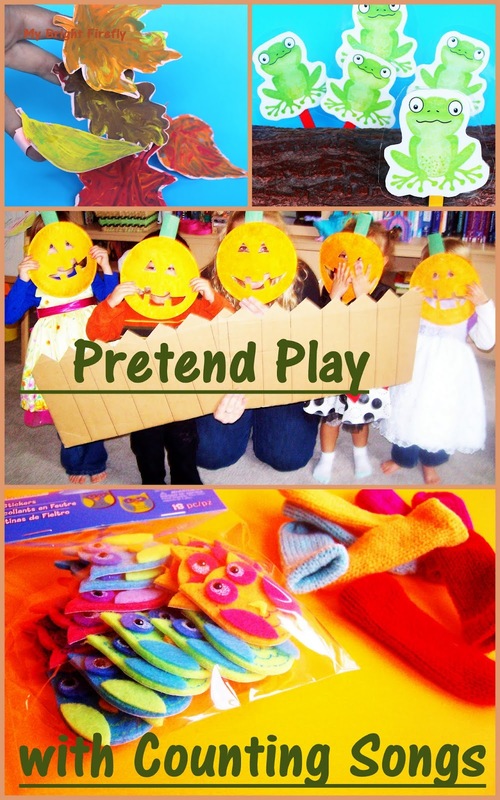 Kids love pretend play and they do love songs with the repetition in them. When you combine the two adding the simplest hand made props, they might just be so excited to sing and count... And count backwards without any visible effort. My Firefly loves these four songs we played with so far! Also, visit our counting and measuring with apples here: T is for Ten on Top. Preschool Math. This free printable of the beautiful autumn leaves, finger straps, and the words can be found here: Printable Autumn Leaf Puppets and a Song from Picklebums. We noticed the different colors of the leaves. Then I printed them out to gray scale using construction paper so that we could play with mixing colors. The leaves are painted with tempera paint using cotton swabs. My Firefly tried different combinations: yellow with dots of green, yellow and orange with dots of green, red and orange, red and brown with dots of yellow, brown and yellow. For her, the combinations of colors came as a surprise. The lines inside the leaves are drawn with a clean cotton swab on a layer of wet paint. We made the owl puppets using store bought stickers on the fingers off the glove. 5 little owls on a moonlit night. 5 little owls are quite a sight. 5 little owls. Are you keeping score? One flew away, and that left 4. Our dear friend Becca has created these props for us. Jack-o-lantern pumpkins are painted paper plates with eyes and mouth cut outs. The fence is a recycled box. The song can be found here (YouTube link): 5 little pumpkins. Kids loved playing pumpkins so much! These awesome froggies are a free printable and a song found here: Five Green Frogs – Kid’s Music Printable from Picklebums. All we had to do is print out, laminate (optional), and attach the popsicle sticks with some tape. My Firefly loves "jumping" frogs into the "pool" and the magic of decreasing numbers on the log! Counting and measuring with apples: T is for Ten on Top. Preschool Math. Counting rocks and playing with dinosaurs: Rocks on the Mirror. Little games with colors, shapes, and tables: Make Fun Friends for Beekle Matching Colors and Shapes. Counting and our easy introduction to bar graphs: Fun with Zoo Animals: Visual Hands-on Math and Graphs.